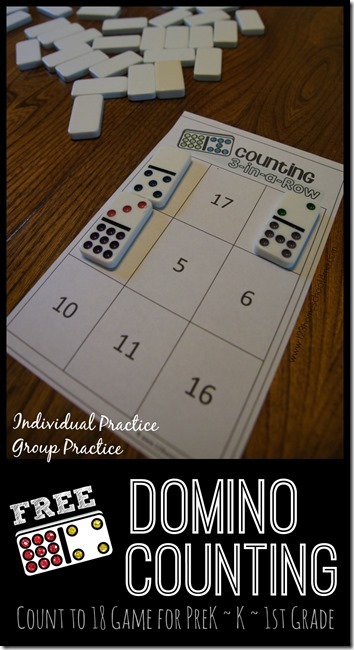 This FREE Domino Counting Games is such a fun, simple to set-up counting game for preschool, kindergarten, 1st grade, and 2nd grade kids using dominos and this free printable. 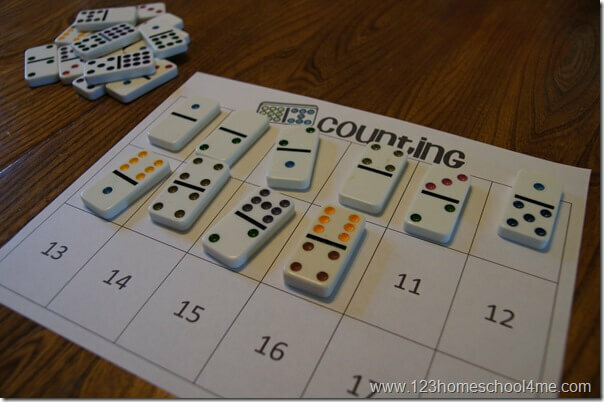 These FREE Domino Counting Games activity requires no prep! Pick which game you want to play and simply print from the free download below and set out with dominos. 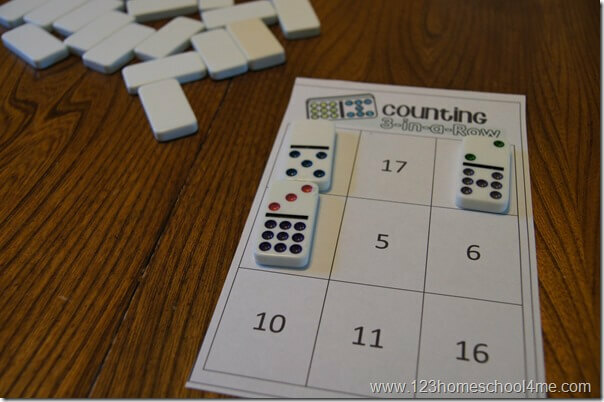 It is simple, fun, and effective at helping kid practice counting to 20. I recommend this activity for preschool, kindergarten, and 1st grade. You can play this by your self by giving children this page and a pile of double 8 dominos. Kids will count dots and put them on the correct spots to count to 18. Or, if you prefer, you can play against others and see who can get 3-in-a-row or the whole card filled first. To play this counting game put a pile of double 9 dominos in the middle of the table face down. Each child will need a Counting sheet (in printable below). The first player picks a domino, counts the dots, and places it on their sheet if they have the corresponding number. If not they return it to the pile facedown. Play continues until someone gets 3-in-a-row. Hint: You can also play this with a memory twist by putting the dominos face down in the middle of the table in a grid. Then students can remember where already counted dominos are and pick them up for their turn.